BOARD MEMBERS PRESENT: Chairman, Dan Smigla, Sandi Jackson, Jim Bidwell, Mervel Delp and Marilyn McManus. GUESTS PRESENT: Fire Chief, Tim Doenges, Matt Overholdt, Jodi Gross, Dave Webb, Todd Wadsworth, Tom Talbot, and Keith Bower. APPROVAL OF MINUTES FROM PREVIOUS MEETING: Minutes of Special meeting and Regular Meeting December 14, 2011 approved without objection. FIRE CHIEF: Doenges reported foam machine, obtained with the DNR grant, is installed and working. Doenges received a quote from Branch County Highway Department for the fire barn driveway. Quote with crack correct seal and coating is $5,300. St. JosephCountyquote was approximately $2,600, which is without crack correct seal because the County does not have the machine with the crack correct function. The consensus was that the driveway needs the crack seal. Surface area of the driveway to be paved is 33,354 square feet. Doenges has been gathering information concerning improvement of the ISO rating. If the Township rating could be dropped to a 7, the savings per household would be $100.00 based on a house value of $125,000. Doenges stated this is something he would like to pursue, even though it would involve placing a large list of procedures into effect. The three new fire department members are currently attending classes and should complete them in June. The Chief reported Brian Mack did not complete instructorsEMScourse and method to recoup expenses will be determined. ASSISTANT FIRE CHIEF/TRAINING CAPTAIN: Webb reported a tarp will need to be purchased to cover the additional hose on truck 911 as it protrudes 1 – 1 ½ inches above the truck and he is concerned that during travel the wind will dislodge it. The approximate cost for tarp would be $325 and he will check for other prices. Ice rescue training will be held next month providing there in ice on the lake. Webb and Doenges are considering how to address the fire members who have not completed their mandatory training classes. RESCUE CAPTAIN: Gross reported she and Doenges need to attend ISO classes for protocol, Webb and Overholdt have already attended. Gross advised she is checking prices for epi pens as they are very expensive. One of the problems with the epi pens is the expiration date. Pens have to be on hand and are quite often not used before the expiration date. 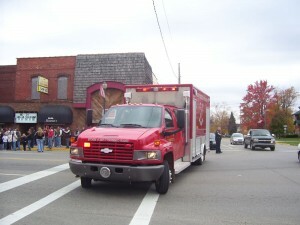 Gross will be holding class in January for Pediatrics and CPR in February. EQUIPMENT CAPTAIN: Overholdt reported all the grease inserts in all the trucks have been greased as required by the DOT inspection. Also, the fitting on the 911 truck was repaired. More hose is needed on truck # 941. Usually hose testing in done on part of the hoses each year, now all hoses will need to be tested every year to comply with one of the requirements for a better ISO rating. Hose testing will be done in house by the fire members. OLD BUSINESS: Jackson and Doenges stated all Board members should receive a copy of the 2012 – 2013 fire department budget at the February meeting. McManus questioned if revenue received from pancake breakfasts and T-shirt sales was revenue to the fire department budget. Doenges stated the revenue from pancake breakfasts and T-shirt sales was all revenue to the Auxiliary. Doenges will do further checking regarding insulation for the fire barn including the amount needed, cost, and installation options. Postings for fire department officers’ election have been done for the election in April. Positions open: Training Captain, Equipment Captain and Rescue Captain. NEW BUSINESS: The board received one résumé for training captain. Meeting adjourned at 7:35 PM by motion of Delp second by McManus. This entry was posted in Fire and Rescue, Official News. Bookmark the permalink.